The Shure PG30 is a robust headset condenser microphone designed for use with Shure wireless microphone systems. This comfortable headset offers maximum freedom of movement for performers and presenters alike. PG30 headset microphone and SVX1 bodypack transmitter. Smooth, natural frequency response comparable to quality handheld microphones. Condenser cartridge for high sensitivity and a smooth, natural sound. 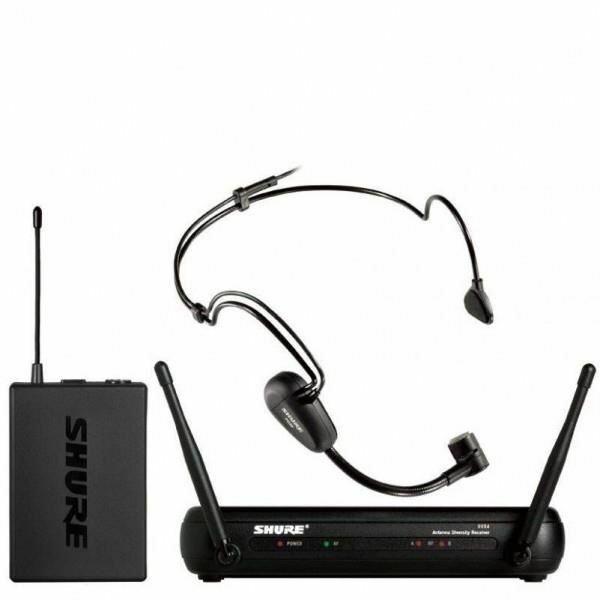 Shure SLX14 Instrument Wireless SystemThe SLX4 receiver brings unprecedented ease of use to wireless with Automatic Frequency Selection and Automatic Transmitter Setup. For use with SLX Wireless.With included rack hardware and detachable antennas, it is ready for immediate installation right out of ..
Mikrofon Wireles Sennheiser EW-100 G4 945SGenerasi keempat dari evolusi nirkabel membuat teknologi nirkabel profesional menjadi lebih fleksibel dan lebih mudah. Untuk musisi, pembicara Sennheiser G4 microphone sangat ideal untuk kebutuhan Anda.Paket ini mencakup transmiter SKM 100 G4 dengan switch m..
Shure BLX14R/MX53 Headworn Wireless SystemThe BLX14R/MX53 Headworn Wireless System is part of the BLX wireless systems family.Shure BLX® Wireless Systems combine professional-quality sound with simple setup and an intuitive interface for legendary audio performance right out of the box. Precision-bu..
Krezt MC-990 Conference Discussion Microphone SystemDescription:Main Machine Specification :Power supply : AC220V+10% 50HzFrequency respons : 20Hz-20KHzImpedance output : REC : 200 ohm ; LINE : 200 ohmImpedance input : LINE : 50K ohmPB-in : 50K ohmS/N : 78dB (1KHz THD 1%)Dimension : 485*220*50mmChai..
Shure UR24S/KSM9 Handheld WirelessShure UHF-R Wireless Systems master the high pressure and extreme conditions of any large-scale touring or installation environment, while delivering unparalleled Shure sound. Rock-solid engineering, the latest technology and unparalled RF performance provid..